Very true, we may very well see that again if the PAC ignites. We'll see how it all unfolds this Autumn. I'm thinking the Aleutian Low will be very strong again this season. Just not to comfortable saying where it's location will be in the NE PAC. If the West sees a another wet winter and east of the Rockies see a very cold winter, I wonder how many big snowstorms you might see. Snowcover is above average so far in the NH. Today's 12z Euro run caught my attention and may hold a clue to the behavior of the PV this Autumn/Winter. Maybe the state of the QBO is already aiding this development, I'm not quite sure, but it is interesting. Normally, you would see Polar vorticity over the Pole but if you take a look at today's 12z Euro run and the 00z EPS run from last night, clearly, these vorticity maxes are displaced off the Pole. You can point out to distinct locations of interest and one being on this side of the Pole near the Archipelago/Western Greenland. Meanwhile, the other across the Pole near Russia/Siberia. I am truly hoping for a chilly Autumn and a cold start to Winter and turning progressively very cold along with snowstorms, some massive. A moderate (-1.0C) Nina isn't all that bad to be honest and I think it would create a more favorable storm track for many of us and keep more cold into the U.S. In terms of weak Nina's, you will have to fight that SE ridge and unless you have blocking (which we didn't have last year), it may be difficult to have sustained cold. So, a mod Nina makes more sense in terms of making next season a winner. 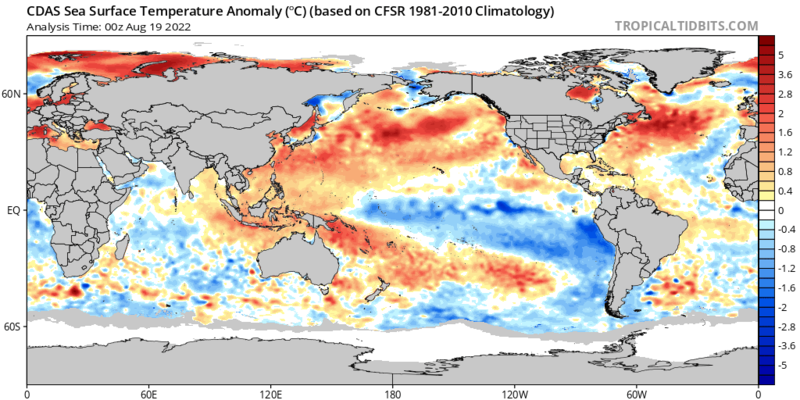 Yeah, I think I had my ENSO states confused (like Ma Nature last winter). Not sure the exact value of the Nina in 2007-08, but we rode the line of "too warm for snow" but it was wet and active if not terribly good for snowcover longevity peeps. I'd take that again in a minute for Marshall. However, I think our friend, Mr. -QBO will lend us a hand with blocking across Canada and a "boost" to cold plunges so that we get a result more like my stream line in red. As you said, helping more folks on here to get in the action. I think 07-08 was not good for many south of I-80. When did you come to MI again? What's the earliest winter you remember here? Yeah, I guess it was. I remember GRR's graphic saying that Nina was a lock for wet, the temps could make that majority rain instead of snow. We were fortunate with most storms taking a track just far enough south to deliver the white gold. Some storms like the NYE "sneak attack storm" Detroit was literally the dividing line between slop south and 17" north. I think Niko's place made out decent on that one. A little bit surprised the 07-08 values were that low tbh. I'm remembering JB saying 08-09 was the "strong" Nina. That is our gold track. Today's 12z Euro run caught my attention and may hold a clue to the behavior of the PV this Autumn/Winter. Maybe the state of the QBO is already aiding this development, I'm not quite sure, but it is interesting. Normally, you would see Polar vorticity over the Pole but if you take a look at today's 12z Euro run and the 00z EPS run from last night, clearly, these vorticity maxes are displaced off the Pole. You can point out two distinct locations of interest and one being on this side of the Pole near the Archipelago/Western Greenland. Meanwhile, the other across the Pole near Russia/Siberia. Isn't this displacement what made 2013-14 so cold over the Eastern CONUS? Yes, indeed, among other things as well. I remember early on seeing strong autumn low's spinning in this general area up north. I don't want an exact copy of 2013-14. It was either brutally cold or record warm here, no in between. Little snow too. But a 2013-14 setup with a mod niña could mean a really good Winter here. 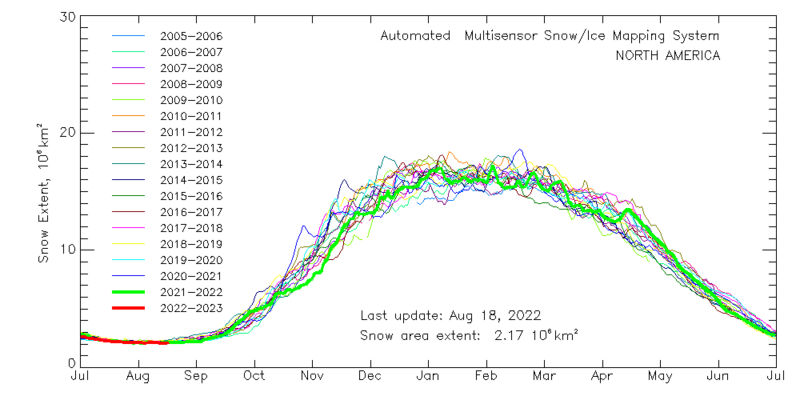 We'll see, but I'm encouraged that this Winter could bring at least 2015-16 (It was good here) snow totals here again. Oddly though, the deep system 11/17/13 was a complete warm storm! Not so much as a fringe of cold or snow that you would expect in the northern lakes by that date. Totally went against the grain of what followed beginning in December. That had to be frustrating for peeps in the UP to have such a strong storm take that track and get nada flakes! My temps are already starting to fall into the upper 40s. Its gonna be a chilly one. Noteable trend favoring a cooler equatorial PAC overall....little late to the party??? Thumbs down @ Cansips. Yikes. why can't these long range models get on the same pg? 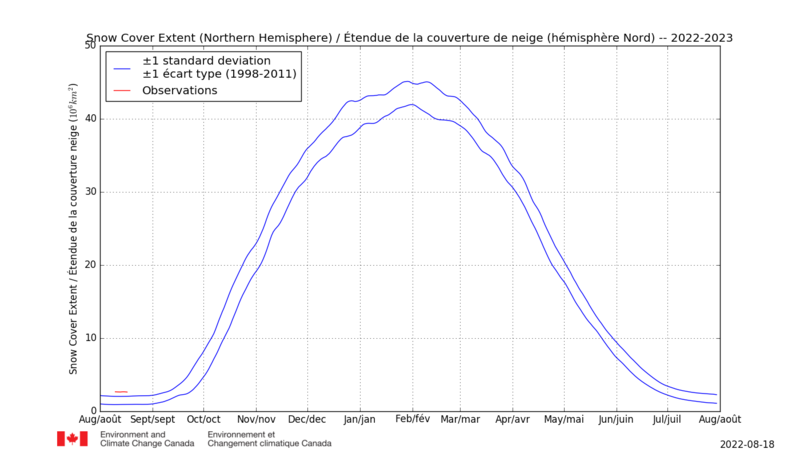 CanSIPS has been pretty awful gauging the pattern late Summer. I think the CFSv2/JMA have been by far the better of the climate models 1-2 months out. A year ago at this time, everyone from WxBell to these guys were onboard with a Nina style winter and it was all looking so good for MI. LOL at Ma Nature and her wicked curve balls. Still shaking my head on how badly this was missed. She'll have the last laugh, even in this day and age. I do feel the odds are way better that we get our Nina style winter we were denied last year. How frustrated was that, indeed. I gave them a nice spit in the face for forcasting Bul*Sh**t.
Ofc, this year they will say a mild Winter and we end up getting a harsh one. They hardly do. Probability standards are too low for that, although, it can sometimes. @ Tom: Not sure we want a full-blown Nina do we? Chicago may do better in those, but not sure SMI would. @ Okwx: Which portion is "too far east"? For a Niña of the forecast strength we see here, the best placement for it would be right on the dateline or as close to it as possible. We'll have to see where the forcing comes from. That's really all that's important anyway. I'd say at this point, I'm in pretty strong agreement with this exact map for this winter. Seems in line with my earlier post as well. Looks like a Nina pattern but with a slightly plunged area in the Plains a couple states south of the maps I posted from last yr.
With #organicforecasting in mind, there's a region that has been screwed every which direction and really screams for balancing by nature. It runs up through Cleveland to Toronto. We've seen several great winters miss them NW and the past 2 miss them just to their east. IF that boundary zone were pushed a bit south on that BAMwx map, it could mean a storm track that favored that corridor. While I'm not calling for that, knowing how Ma Nature thinks it wouldn't surprise me. That regions overdue tbh. As a follow-up thought. Originally Harvey was shown getting further north and clipping SMI with his rains. But he stayed just south and got OH. Maybe I'm reading this too literally but in 08 Ike drenched Marshall and the following winter was historic. Be interesting to see if this TX soaker predicts the winter Bonanza zone in similar fashion? I think the Plains States (TX, OK, SD, ND, NE and KS) will constantly go back and forth between above and below average temperatures. Yup, I think your right. SPC's day 1 convective map for tomorrow (Labor Day) outlines the "slight risk" area from just SE of Marshall down thru most of OH. If forced to pick, that'd be my exact axis of snow jackpot zone next winter. They've had an active and wet warm season as well including Harvey and now some models want to send them Irma to boot! Both CFSv2 and CanSIPs are showing a similar look across the equatorial PAC and creating the coolest of waters in the central PAC. Both CFSv2 and CanSIPs are showing a similar look across the equatorial PAC and "CREATING THE COOLEST OF WATERS IN THE CENTRAL PAC." "So you're sayin' there's a chance!" Early thinking is we have a -NAO pattern setting up as we open October. Not sure just yet on the state of the AO but leaning towards neutral to slightly negative. Looking forward to seeing the new CPH pattern set up next month. Here's an update on the status of the N PAC SST's and we can see the waters bubbling up in the NE PAC along the western N.A. coastline. On top of that, the waters in the NW PAC continue to torch as well. This would support a ridge of HP just east of Japan with a downstream trough south of the Aleutians. And as you see, the lake is responding. Quite the showery morning here in St. Joseph. Last year was the first year in a while we didn't have any WSW snows here. We had one WWA for snow the whole year. I feel like a mod niña combined with a colder setup should help get the WSW streak back going here. I'm seeing intriguing signals pointing towards a very active PAC this cold season and it will be a loaded pattern with moisture. I think storms will be plenty, but how much cold will infiltrate the pattern??? Still up in the air as to who gets to see the jackpot zone. This winter will be much different than last season. I feel more of our sub forum will have their chances of seeing snow unlike the past couple of winters. There are several contributing factors that we didn't see the past couple season which are playing in favor for winter wx fans. 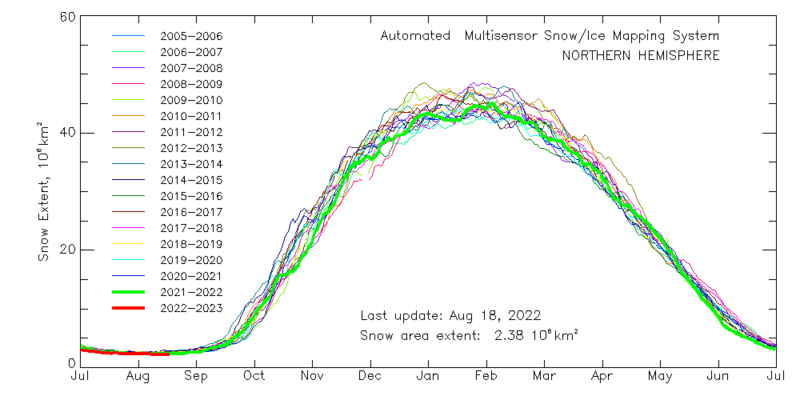 I'll comment more on this as we get closer to October, moreso, as the new CPH pattern sets up. Just looking at the CFSv2 weeklies, you can see a favorable 500mb pattern across the eastern CONUS with a definitive -NAO block as we open October. This is as clear of a La Nina signature as you can get. Sounds similar to 2015-16 here. Bad year for most of the sub, except us over here. Got a ton of favorable clippers plus a storm which produced well here despite the dry slot. Wish it didn't end so early. Last year was top 5 least snowy in my part of the state. This decade has been awful overall in this area. Oh yeah, awfulness. Last year was the worst in the sense that we didn't have one big storm to at least make the Winter fell like something. Ya know how awful it was to expect a rainstorm in January and February followed by colder air or bitter cold. Most of my Winter was like that last year. Snowfall was below average indeed. Sucky Winter. The year b4 that was similar. 2013 surely had break-away periods from mid-Sept to mid-Oct, then that massive spike (N Amer) in 2nd half of November - wow. Must've been up in Canada though, cuz it didn't get serious for SMI until 2nd wk of December. Only a couple wks ahead of traditional timing tbh, so I still don't consider that an "early" winter despite this historic winter it was. '89, 00, 08 etc fall into the "early" category producing plow worthy events across all of SMI, not just the LES regions.